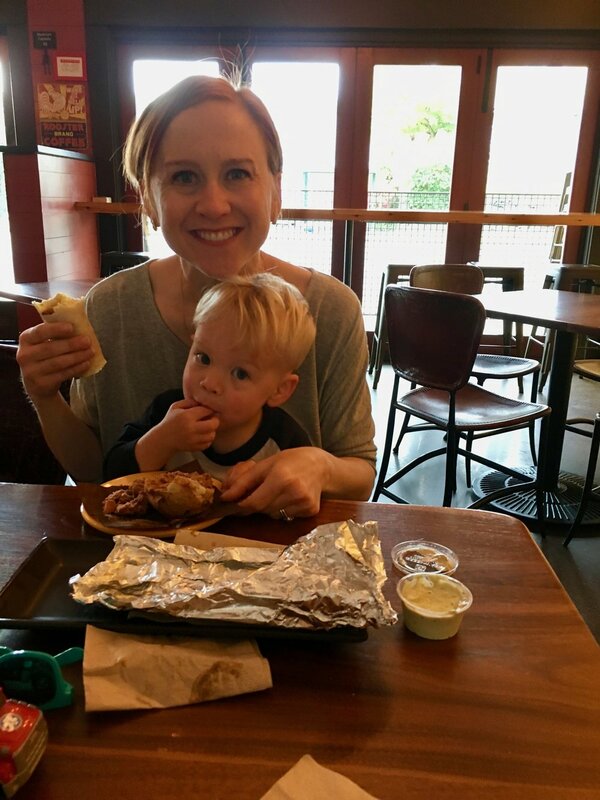 The motivation for my Red Elm and the Antique Sandwich Co. reviews was that they were known in my "mom circles" as places for kids. Brewer's Row, however, isn't widely talked about as a place for kids. However, my experience there with my son, Caleb, have been great. It's casual and fast which make for a fun place to grab a bite to eat if you have little ones. Let's taco (I mean talk) about it. Brewer's Row is tucked away just outside the main Proctor district area on North 26th and North Alder. It's right next door to Cook's Tavern and down the block from Rosewood Cafe. There is a small row of parking spots, otherwise, you can use free street parking. It's a nice neighborhood area, so no weird feelings about safety. You could totally walk here from the Proctor area, but it would be a few blocks (which can be painful with a toddler). We really enjoy this restaurant for breakfast, lunch, and dinner. Yup, it covers all the meals of the day. We go here on a regular basis. Lately, we've been going mostly been for breakfast since it's filling, tasty, and not crazy crowded in the mornings (shh don't tell everyone, but we're often the only ones in there!). Plus, breakfast is probably the easiest meal to eat out with a toddler, in my opinion. If we have Brewers Row for lunch or dinner, 9 times out of 10 we get take-out. This is a more casual restaurant experience where you order at the register, get a number, and they bring your order to you when it's ready. Generally, these types of restaurants are quicker dining experiences. They also have a good selection of beer and cider on tap or bottles and cans in the refrigerator. The food is more taco and burrito, street style Mexican food rather than full-on Mexican plates (although you can "make it a plate" with beans and rice). The service is helpful and friendly, and we've never had a problem. Every once in a while, we find the food a bit slow getting to the table, but nothing extraordinary and might be something of the past since we've not had any issues in our more recent experiences (maybe they recognized this issue and tightened that up a bit). 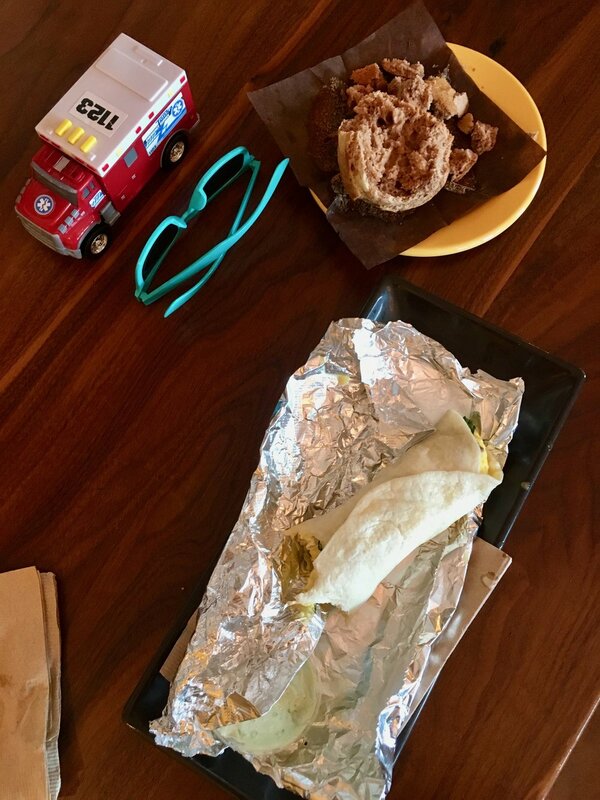 All in all, you'll see us returning here frequently for our taco fix. There is a small outdoor seating area has stool seats. 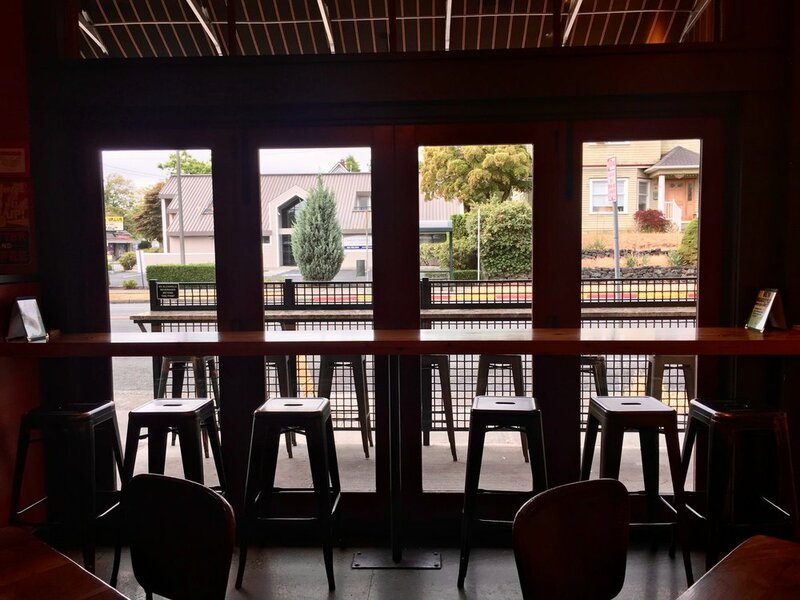 When you enter the front door, there is table seating to both your left and right. Then you walk down along a long, high table with shared seating (see the first photo in slideshow) to get to the register. There is also stool seating by the front door in the window if you're sans-kids and want to have a nice look outside. There is a small pastry and dessert case up by the register as well. With very tempting treats. We usually get Caleb a treat and take our own nibbles from it - muffins, cinnamon rolls, cookies, scones, etc. To the far right is the refrigerator with beer, cider, wine, and soda. As well, as the soda fountain and utensil area. Got a feel for it? See the photos below, they might tell the story better. Photos: Use the arrows or click the thumbnails to see all the photos! The food is great. All sorts of options for your tacos and burritos - chicken, fish, beef, pork, and papas dulce (sweet potato/kale). Tacos are fun because you can get a different protein in each taco. The burritos are hearty and you will definitely leave with a full, happy belly. There are also salads, nachos, torta (aka sandwiches), quesadillas, and tortilla soup. In addition, they have monthly specials that can be rocking good. For dessert, you can grab a cinnamony delicious churro, too! Gosh, I really haven't had much I don't like here. The papas dulce (sweet potato/kale) is great for vegetarians or folks that just want some good veggies. I often get this in my breakfast taquito. For me, it's a tad bit on the spicy side. I believe they add some more spices to the mixture as they cook it up, so I often request they don't add that when I order and it turns out just right. When I order tacos, I usually order the pollo, al pastor, and pez roca (fish). And my favorite salsa is the avocado crema. Josh loves the roasted habanero sauce, but that's too much heat for me! As I mentioned earlier, they offer beer, cider and wine in addition to the regular soda options. There is also agua fresca (basically a fruit juice), kombucha, and coffee. Now, let's talk coffee since we go there for breakfast a bunch. The espresso beverages are just average. My usual coffee drink is a latte, but here I just order the brewed, drip coffee as I think it's much tastier. Plus, you get free refills on drip coffee. The horchata latte is always tempting but just doesn't deliver the flavors you're looking for in horchata. All this is just my opinion, so if you feel the need for an espresso drink, go for it! We always see families here when we dine here. There isn't a kids corner or toys, but it's still a good restaurant for families. The casualness of the restaurant is great since you don't have to worry about noisy kids. The service is quick so you're not there for eons with a bored or bonkers kid. If you just can't handle it, you can also take your kid out for a walk or stroller ride in the neighborhood while the rest of your party finishes up. Been there, done that. It's a pretty chill place. As for food, I haven't seen a kids menu, but they have some good options that I think kids would enjoy. There are quesadillas and tacos. You can order just single tacos if your kid is a light eater. Caleb will often eat tortilla chips, so an order of those could work as well. You could also feed them the delicious sugar treats from the pastry case like we do and deal with the aftermath later, haha. Caleb won't let us pass up a cinnamon roll once he's made eye contact. Luckily, he doesn't really eat the whole thing since he is a grazer when it comes to eating. This is a great place for food and families. The food is solid and delivers good flavor. There are tasty food options for everyone and it's a trendy, hip place for dining in Tacoma. 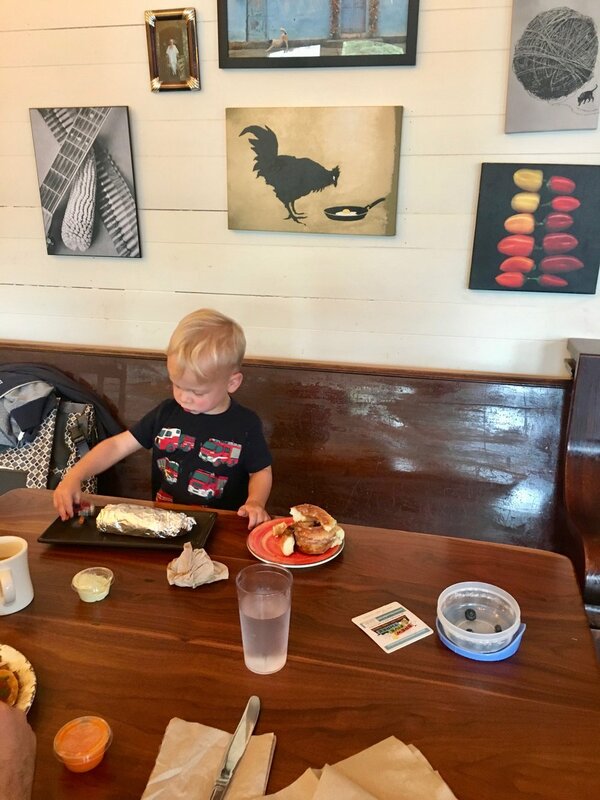 Caleb likes the chicken picture, but the decor is fun as well. We haven't been when it's crowded, but I do hear it gets crowded. They have some TVs which I believe they'll place sports games on so game time is likely a busy time from Brewers Row. 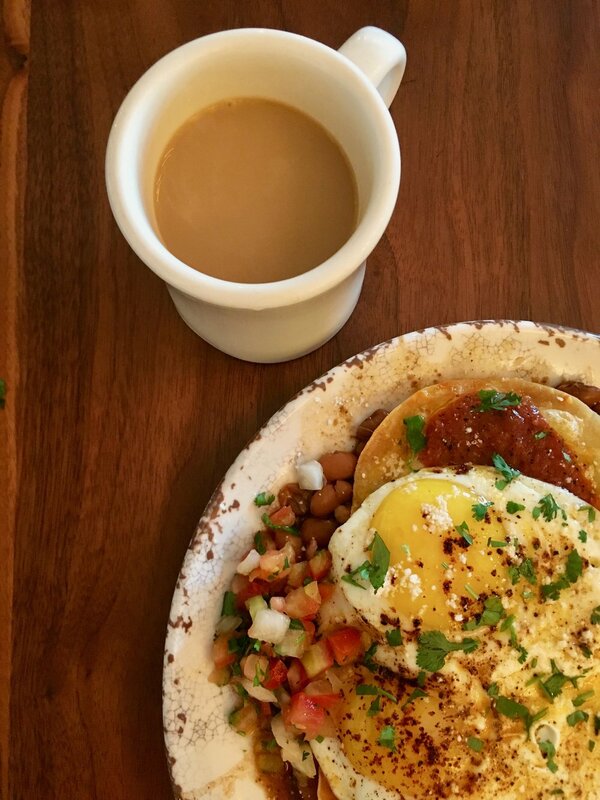 If you haven't had Mexican food for breakfast, I also highly suggest you give it a whirl. Josh introduced me to the concept and I haven't looked back. Overall, I would recommend checking this place out for any meal of the day. If you've been, or do end up go, let me know how you like it. Do they have High Chairs? Yes! Can I bring my Stroller in? Yes, it is big enough inside for you to roll on in. If it gets too crowded, though, it can be tight. If you enjoyed this Checking It Out, then read my Red Elm and Antique Sandwich Co posts, too! Please note: I was not asked or paid to write this review. This is just my own opinion and experience that I wanted to share.